Jumping on the hot, new trend can be extremely lucrative or extremely difficult for entrepreneurs because you must find a way to distinguish your product or service as the new kid on the block. Cate Luzio, Founder & CEO of Luminary, left her 20-year banking career to build a physical space for women to develop, network and connect. We sat down with Cate to discuss how she used crowdfunding to launch her business and how she’s paving the way for Luminary in the sea of female-focused spaces. Q: Tell us about Luminary. 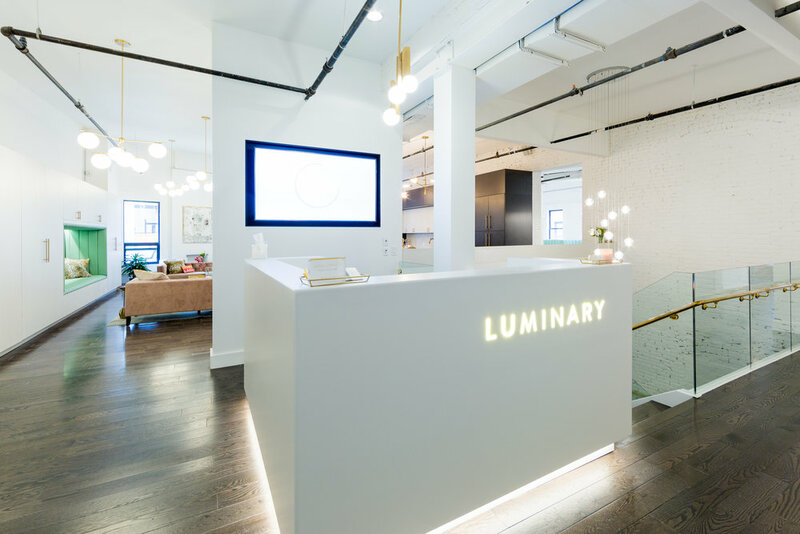 Cate Luzio: Luminary is a new collaboration hub and meeting space for women who are passionate about professional development and expanding their networks. We created an ecosystem of quality programming and amenities for women. We opened our doors in November 2018 and our members have access to 15,000 square feet of open workspace and communal areas in the NoMad neighborhood of New York City. Luminary has everything you need to fit in your day with a fitness studio with various classes in barre, HIIT, yoga, pilates and more, a beauty Bar in partnership with Glam + Go, numerous conference and meeting rooms, event space, phone booths, a lactation room, free coffee and wine on tap and so much more. Q: What’s sets Luminary apart from other co-working or wellness spaces for women? CL: Luminary exists because there is a growing need for more spaces and places for women to invest in themselves and their self-care. Luminary is the ultimate career advocate for women. We lead with a deep commitment to supporting and advancing the careers and businesses of our members through a comprehensive slate of daily programming. We are all about community and women supporting each other. These are just some of the qualities that set us apart. Q: What advice would you give to women creating products/services in industries where solutions have already been built? CL: Create it! If you have a concept or product idea that you’re passionate about – write a business plan and make it happen. Even if there are existing solutions in the space – hone in on what makes your idea different and lean into that. It’s also important to survey and understand the landscape you’re entering to see what other players in the space are doing – this will help you to see your unique opportunity. Innovation and disruption often happen in established industries and you could be leading the next big change. Q: How did you know you were ready to leave your 9-5 career and pursue your entrepreneurial dreams? CL: After leaving my job, I started weighing other banking opportunities. I attended an intimate, networking event with incredible women. The conversations were so fascinating and each woman wanted to stay connected, extend help and their networks. I rode home on the subway and thought, “How can we do that on a larger scale?” I started writing down all of these ideas and those ideas translated into the business plan for Luminary. I was so committed to this concept and getting it off the ground. I did my research and hit the road to visit other women’s spaces around the country, led focus groups for feedback, and poured all my energy into the concept. Given my dedication to creating Luminary, it was clear that this was more than a passion project or a hobby. I knew that my next step would be as an entrepreneur. CL: We partnered with iFundWomen for our membership drive. We offered discounted, pre-sale memberships on the platform to ensure we had a strong community of women before we opened our doors. We’re committed to partnering with other women-led businesses like iFundwomen and the platform already has such a strong community of female founders, entrepreneurs, and business owners. Q: How long did it take you to prepare for your campaign, and what advice do you have for someone planning to launch her crowdfunding campaign in 2019? It took us about two months to prepare our campaign for launch. We took time to think through the content and messaging and how we wanted to showcase our membership options and rewards. We also did a campaign video and that was essential to explaining what Luminary is all about before the physical space opened. People respond well to visuals and I highly encourage those looking to crowdfund to invest in a video and their website. Another tip that I would offer is that it’s alright to make changes after you launch your campaign. We took in feedback and made changes to respond to what people wanted - iteration is alright. I would also say that you need to cast a wide net with your outreach, encourage others to share and don’t be afraid to follow-up. Don’t be afraid to lean into the experts at iFundWomen; this is their business so the guidance, coaching, and learnings they can provide are instrumental. Q: What are your greatest learnings from your crowdfunding experience? CL: I learned a great deal throughout the crowdfunding experience. Luminary is all about building community and I found it so helpful to start by building bonds online through the crowdfunding campaign. It’s hard work so be prepared. The campaign helped me build stronger relationships within my network and even identify those who are great brand ambassadors – spreading the word with me. Q: What are Luminary’s 2019 goals? CL: We are excited to bring more members into our growing community. This is our first year so we are looking forward to focusing on our roster of professional programming, kicking our fitness offering into high gear, and bringing more and more inspirational voices in to meet and interact with our members. We ultimately want to create personal and one-of-a-kind experiences for each of our members so that they feel at home with us.